What is rather amazing, however, is the reaction to these remarks. 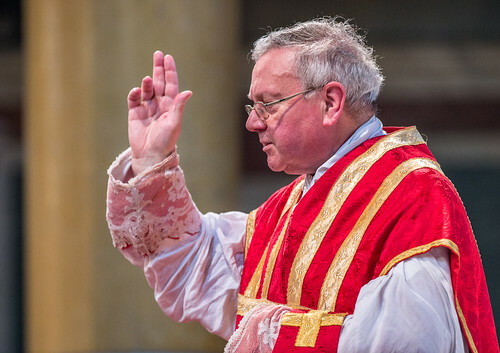 Cardinal Nichols has written to his priests, the Vatican spokesman Fr Lombardi has made a statement, even Fr Spadaro SJ and Austen Ivereigh have felt the need to get in on the act: all with a view to contradicting the basic idea, that celebration facing east would be a good idea. Of course, they, like Cardinal Sarah, are all entitled to their opinions, and Cardinal Nichols is not just entitled, but obliged, to exercise prudential judgement in guiding his priests. The debate has been marred somewhat by a technical dispute over the correct translation of a passage in the General Instruction of the Roman Missal - this is the kind of tedious issue which those who are really interested can look up in a footnote in the Position Paper (see footnote 1). But let me say something about the bigger picture. This debate is inevitable and intractable because both sides are right. Cardinal Sarah, Pope Benedict, Cardinal Schonborn and Fr Michael Lang (in his book Turning Towards the Lord) are perfectly and undeniably correct that from a historical and theological perspective worship 'versus populum', facing the people, creates a problem. It doesn't invalidate the Mass or anything like that, but it is for practical purposes a massive rupture in historical continuity, for all the precedents which can be argued for it, and gives expression to a conception of the liturgy as (in the words of Pope Benedict) a 'closed circle', the community 'worshipping itself'. Not only is this second point the impression gathered by those, like Pope Benedict, with an acute ear for what is going on in the liturgy, but it follows from what the supporters of vs. pop. celebration themselves say in its defence: that they want to engage face-to-face with the priest, that they prefer chairs-in-a-circle type celebrations, that they want to emphasise community, and so forth. Facing East to make the offereing. On the other hand, Cardinal Nichols, Fr Lombardi and the others are perfectly and undeniably correct that, for practical purposes, celebration vs. pop. is an integral part of the liturgical reform. Yes, celebrating the other way is allowed, as is celebrating in Latin. But in both cases the thrust of the post-conciliar documents is that these are things allowed for only in particular situations with particular justifications. For example, Latin is suggested for international gatherings. Celebration ad orientem is conceded, for example, where the altar cannot be moved away from the wall because of its historical or artistic value (see the Position Paper footnote 2). Yes, it is true that the rubrics make reference to the priest turning around at certain points to face the people. (Fr Spadaro quoted one of these, apparently under the impression that it implied the celebrant faced the people all the time, when it does the opposite.) Well, they have to, if the concession is made that Mass can ever be celebrated ad orientem. And anyway, this is an amazingly weak argument. Just as--whatever Vatican II in Sacrosanctum Concilium said--Pope Paul VI told the world that the reform meant Mass in the vernacular, in the same way his big, media-event Mass to inaugurate the reformed Missal on the first Sunday of Advent 1969 was vs. pop. Vs. pop. celebration is simply one aspect of a coherent programme of reforms which aimed at promoting a particular form of liturgical engagement. It goes with the use of easy-to-understand vernacular, the drastic reduction of the use of silent prayers by the celebrant, the replacement of the Church's musical patrimony with music the congregation can itself sing, the theological simplification of liturgical texts, and the shortening of lengthy ones. The multiplication of lay liturgical roles like readers and Eucharistic Ministers are a natural extension of the same idea. By all means let us discuss the success or failure of the project, by all means question the kind of participation being aimed at. But let's not pretend that there is a 'genuine reform', intended by some mysterious 'spirit of the Council', which comprises some of these elements and not others. They may not all have been mentioned in Sacrosanctum Concilium, and indeed official documents are in many instances in tension with each other, but they all pertain to a single conception of what liturgical participation means, and to this extent they stand and fall together. Facing the people to give them a blessing. Those attached to the kind of liturgical participation brought in by the post-Conciliar reforms see, with varying levels of explicitness, worship ad orientem as a major step away from those reforms: and they are correct to do so. This is why attempts to introduce ad orientem can cause civil war in parishes. And the danger of civil war is one reason, I have no doubt, that it stimulates such a rapid response from people like Cardinal Nichols and Fr Lombardi. The organisers of the Sacra liturgica conference, aiming to show that the Reform of the Reform agenda is still alive and kicking, have succeeded in showing just the opposite. There is absolutely no future in trying to inch back the reform in the teeth of this kind of opposition, any more than the First World War could be won by waves of infantry charging machine guns in order to gain territory a hundred yards at a time. 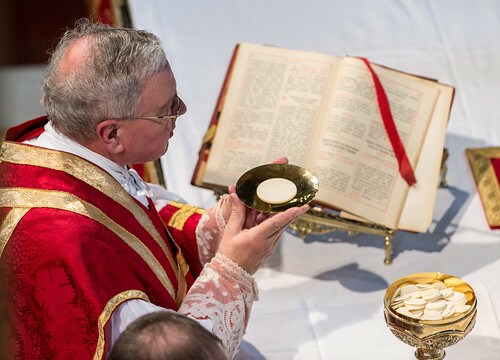 As I have argued on this blog before, it is a far simpler and generally more pastoral way forward for priests to introduce the Traditional Mass into the parish schedule, than to go to war over ad orientem and all the other issues in the Novus Ordo. Since, as I have argued, celebration versus populum is problematic, I admire and support priests who make the change to ad orientem in the Ordinary Form. What I can't do is defend them against the kinds of arguments which will inevitably be brought against them: that what they are doing is contrary to thrust of the post-Conciliar reform. Because it is. I've written about the Death of the Reform of the Reform under its own label on this blog, and there are even more posts about the Reform of the Reform. The turning around of the priest to greet the people during the Traditional Mass is itself an interesting topic, noted at the beginning of the Position Paper on the Kiss of Peace. Well in the Eastern Churches. Both Eastern Catholic and Eastern and Oriental Orthodox all face East, with the Maronites, being the one exception. They have no issues. Only Rome and the West gets into viral debates about facing ad orientum. Seems like most Catholics in the West want to mimic the Protestants, and form a circle, rather than be like the Christians who still inhabit the East, and face the east. Seems to me that the Ordinary form of the roman rite is severly flawed and needs to be corrected. Be more Orthodox Catholic, than Protestant Catholic. did St's Benedict, Dominic, and Francis face the people when they were at Mass. did they have a tissy fit like Cardinal Nichols who right away ran to Papa Francis, because he know more. Maybe he should have been the prefect of the Congregation for Divine Worship and the Sacraments. Than unity with Protestantism is a done deal. and the East are heretics!. Point to ponder!! "What I can't do is defend them against the kinds of arguments which will inevitably be brought against them: that what they are doing is contrary to thrust of the post-Conciliar reform. Because it is." So what? The post-Conciliar reform was, for the most part, a grave mistake built upon false premises and assumptions. Any attempt to correct a mistake, no matter how thankless and difficult the task, is to be applauded. The task would be made easier though, as you say, by introducing the TLM into the parish schedule first. The fact that there are still priests out there who are prepared to do what is right rather than do what is "pastoral" (whatever that word really means) is heartening. 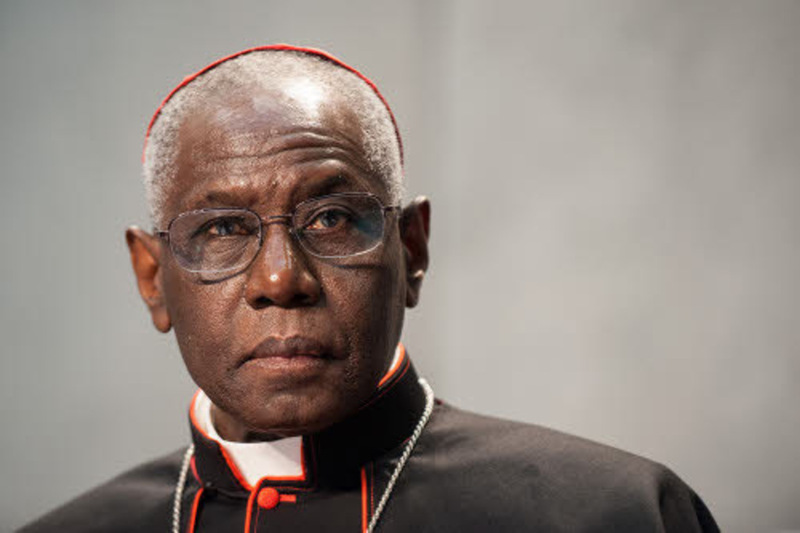 When Cardinal Sarah’s book God or Nothing was published in French early last year, Sandro Magister tipped him as a leading ‘papabile’. When the book came out in English a year later, the Catholic Herald and other papers lavished similar praise on him. But now, with this call for switching to Ad Orientem with an expressly stated November 30 deadline, he seems to have overplayed his hand. He didn’t get advance clearance for his proposal, as he must now realise he ought to have done. A barely concealed public rebuke from Pope Francis, dutifully echoed by Fr. Lombardi and Cardinal Vincent Nichols, among others, can have done his prospects no good at all. For many people, Sarah had clearly come to be seen as the conservative front-runner to block the feared election, at a future conclave, of Cardinal Reinhard Marx, the candidate of the German Kasperite party. After this Ad Orientem setback, however, they may have to start looking for someone else to pin their hopes to. Good points graciously put Dr. Shaw. Perhaps the LMS could write to his Eminence to encourage greater availability of the TLM in his diocese in light of this. That being said it seems obvious that in parishes like St Bede's Clapham where all the Novus Ordo's are said 'Ad Orientem' there is little division or polemics amongst the parishioners. "...it is a far simpler and generally more pastoral way forward for priests to introduce the Traditional Mass into the parish schedule, than to go to war over ad orientem and all the other issues in the Novus Ordo." This accords with my experience quite well: My pastor found it easier to simply tack on a TLM onto the Sunday Mass schedule (it helped that he had only two NO Masses to begin with, to be sure) than to radically rework the celebration of the NO Masses. Attendance has been steadily growing ever since. The north end! That's going back a long wag.